I bring you another simple stereo audio level indicator for amplifier or other audio equipment. 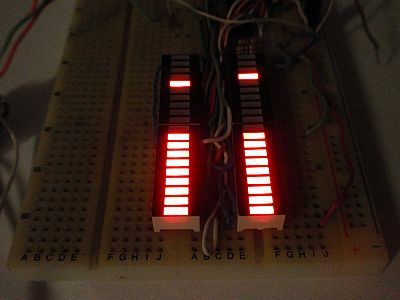 It has 2 columns of 20 LEDs and peak indication. 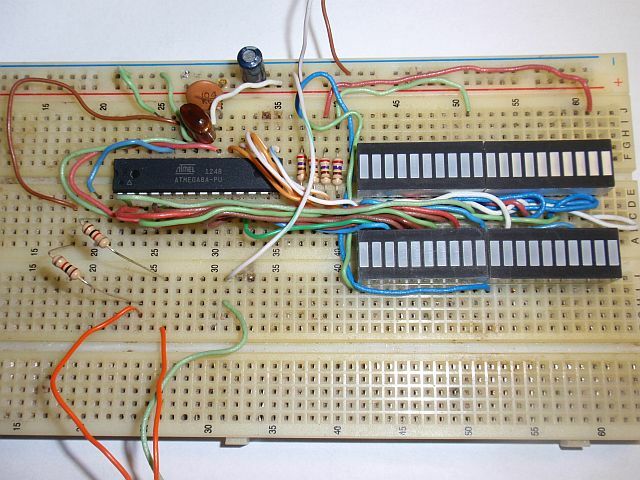 It is driven by the integrated circuit IO1 - Atmel AVR ATmega8A or older ATmega8 or ATmega8L. The only integrated circuit provides an indication of both audio channels. The indicator has 20 LED divisions on each channel, 1 division corresponds to 2 dB. Display range is -34 to +4 dB. When exceeding the level of excitation of 0 dB (18th LED), the overdrive occurs. 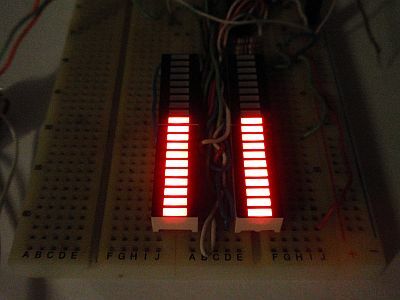 As the indication LEDs you can use monolithic columns (bar graph displays) or individual LED diodes. LEDs are controlled multiplex way in 10 steps, 4 LED in each step, frequency of multiplex is about 100Hz. Resistors R1...R4 determine the current and thus the brightness of the LEDs. The signals of left and right channels are connected to the inputs of analog to digital converter ADC0 and ADC1. Fall time (fadeout) of scale is about 600ms. The device is also equipped with indication of the peak level indicator that can be activated with a jumper in the diagram labeled IM (Indicator of Maximum). Sound level indicator is powered from a 5V supply and consumption is about 45 mA when all LEDs are lit. The capacitors C1 and C2 should be placed as close as possible to the integrated circuit IO1. 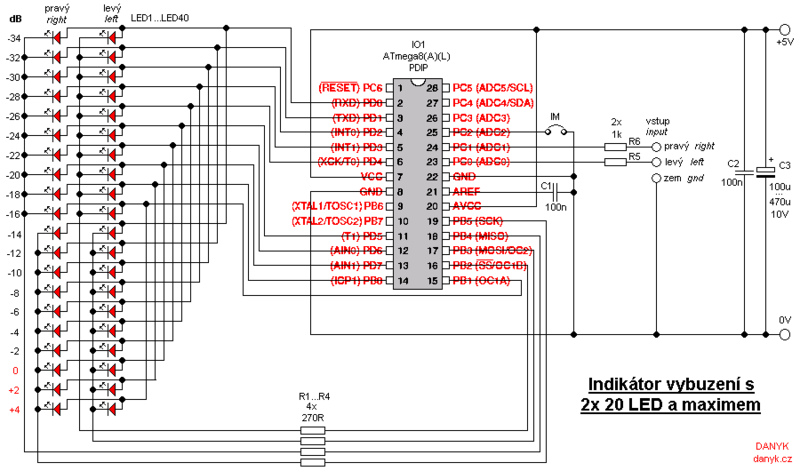 Schematic of sound level indicator with 2x 20 LEDs and peak indication with AVR ATmega8A / ATmega8 / ATmega8L. Sound level indicator operation. On the left photo with peak indication off, on the right peak indication turned on. Video - testing the LED sound level indicator.